Here at Wormtec Worm Farming and Vermiculture we have been fertilising and repairing Sporting Fields for around 16 years now, One of the first lessons i learned was, to not treat the symptoms you are seeing with the Turf Grass, you need to go back one more step and fix the cause of the problem if you wish to grow nice thick Healthy Turf Grass on a Sporting Field. 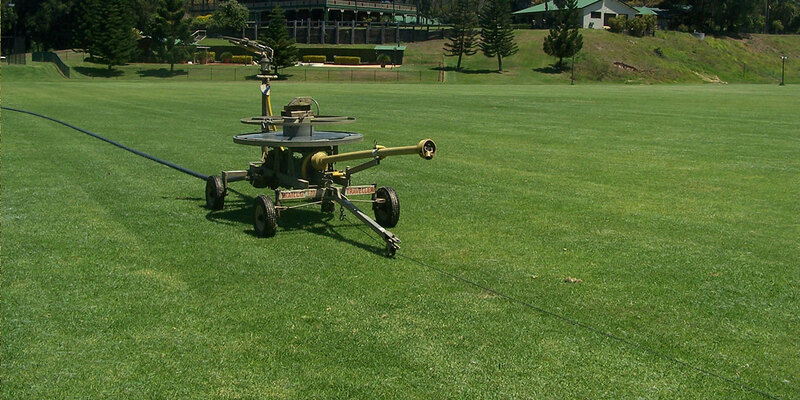 By repairing the soil structure and soil health and vitality, you will grow far better turf grass, the Sporting Field will also have a far better playing surface that will require far less maintenance, you can reduce your fertiliser requirements by moving away from chemical fertilisers as these are the main problem. Chemical fertiliser is also impossible to keep in the soil profile with irrigation and heavy rain leaching the chemical fertiliser out of the root zone and into ground water supplies, this then pollutes our natural water supplies killing fish, frogs and causing unknown damages to our precious Eco system. Children and sporting players also breath in this chemical fertiliser that is on the dust on these sporting fields, another cause for concern, people can also have skin complants once they have been in contact with these chemicals. The ground staff maintaining these fields are also in contant contact with this dust whilst mowing and doing grounds maintenance. If you want a Sporting Field that has a softer surface to reduce impact injuries from sport, requires less water, has more tolerance to both stress, turf disease and pest attacks, with no need to aerate or de-thatch the soil then you are ready to look at a more sustainable approach to fertilising. Without the side effects of chemical fertilisers use. Wormtec Worm Farming and Vermiculture produces an Organic Microbial Fertiliser called Wormtec Organic Worm Extract Microbial Fertiliser to combat all the negative impact that chemical fertilisers are having on our soils and Eco sensitive areas, Wormtec Organic Worm Extract Microbial Fertiliser is not a NPK fertiliser, it works by the use of micro-biology cycling nutrients for plant growth, whilst building soil structure and also has the ability to reduce pest and disease attacks with its bio fertiliser side. If you would like to reduce and then eliminate Soil compaction, Ph Level problems, Turf Stress, Excess Thatch, Shallow Root Growth. Reducing Turf Grass Pest and Disease attacks and start the job of making your sporting field drought tolerant then I would start looking more closely at Organic fertilising of Sporting grounds with Products like Wormtec Worm Extract Organic Microbial Fertiliser. Wormtec Worm Farming and Vermiculture and their team is here to help you succeed, in improving the growth and health of your Sporting Fields. We will assist you in improving what you already do and know, and will also share what I have learned over the years improving Sporting Fields by repairing the Soil with Micro-Biology, Soil microbes are the missing link to combating Soil Ph issues, Soil Compaction, Turf Root Growth and Pest and Disease attacks on your Turf Grass.